UK Prime Minister, Theresa May has condemned President Trumps retweets of a an inflammatory tweet from British far right group, British First, saying "It is wrong for the President to have done this." The office of the Prime Minister further said: "Britain First seeks to divide communities by their use of hateful narratives that peddle lies and stoke tensions. They cause anxiety to law abiding people." 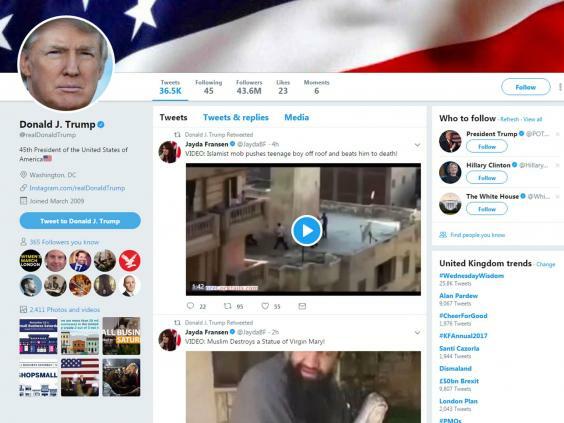 Earlier in the day, as we reported, President Trump shared via Twitter, videos of Muslims allegedly attacking people. The images, many believe, are likely to fuel anti-muslim propaganda and anger amongst a lot of people, mainly those in the President's base. The Tweets Trump re-tweeted were from Jayden Franden, the deputy leader of a British far right group, British First, notorious for their anti-immigration and anti-Muslim stands. Ms.Franden was once charged with "religious aggravated harassment" in the UK. It isn't clear whether the perpetrators in the videos are actual Muslims, although the video first surfaced in a Dutch website. The group was formed in 2011 by former members of the far-right British National Party, and states that it aims to defend the British people from the liberal left.